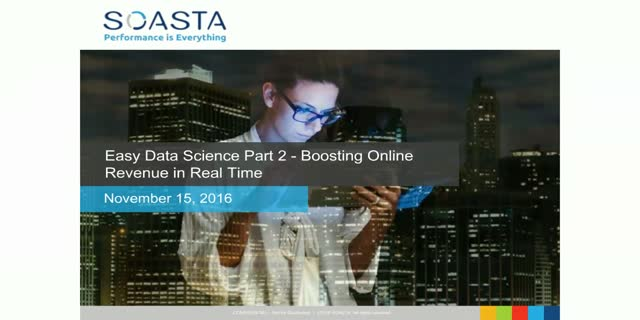 Join Mat Ball and Iris Lieuw for a tech-talk on how SOASTA data science provides your company a competitive advantage. In this power-packed 30-minute webinar, you’ll learn how companies like Lowe’s and Office Depot use data science to successfully compete against the retail behemoth that is Amazon. Your webinar hosts, Dan Boutin and Mat Ball, will share how your site’s unique DNA can be harnessed to create exceptional customer experiences and business outcomes while improving IT performance... all within a super-competitive online retail marketplace. 1. How Lowe’s and Office Depot successfully use Digital Performance Management (DPM) to maximize ROI from web and mobile traffic and marketing campaigns. 2. The increasing importance of data science for both rapid and long-term decision-making. 3. How to gain a deeper understanding of your company’s performance DNA and learn how to take advantage of opportunities that are unique to your site and your business. Your takeaway from this talk will be a insights and best practices that you can put into play to drive site traffic, gain visibility into how shoppers use your site, optimize customer experiences, and connect the dots between digital performance and business metrics. Do visitors hate your website's performance? Research shows 43% of website visitors are unsatisfied with website performance. Time is money! In today’s hyper-digital world, digital performance means business performance. If your customer’s digital experience is lacking, your revenue will suffer. Customers are – rightly – expecting every touchpoint with the companies they do business with to work every time, at top speed. If you drop the ball – even for a few seconds – you’ll lose business, and worse, you’ll lose customers. Digital Performance Management (DPM) technologies and services exist to help companies identify critical weaknesses and performance bottlenecks across their digital assets. By providing clear insights and guidance, Digital Performance Management tools make it possible to get ahead of potential performance challenges before they’re discovered – the hard way – by your customers. Join Jason Bloomberg, president of Intellyx, Trey Kistler, Director, IT eCommerce of Lowe’s and Carl Briscol, VP of eCommerce Technology, Home Depot and Scott D. Lowe from ActualTech Media. Most organizations have internal processes to address performance problems, but they are typically reactive—occurring only after online performance has already been degraded. Relying on a defensive strategy to address performance problems can negatively impact end-users and revenue before you’re able to identify and solve the issue. This web seminar will explain how to customize performance practices to build proactive internal testing processes. These methods will help you detect and solve performance problems before they make it into production and cost you money and customers. Is your mobile website ready for load? Can your mobile app's back-end scale to service peak demand? Your website is probably one of – if not the – primary revenue drivers in your company. But do you know what’s really happening to your visitors? If you have third party components on your site, how do you manage the risk and the ROI of the tools provided by these parties? Join the discussion with Web Performance experts: Scott D. Lowe & Buddy Brewer, SVP of Products at SOASTA, to get a better understanding of the impact 3rd party scripts can have on your site. We will be joined by Jason Trester, CBS Interactive’s Senior Director of Site Engineering. Jason will share with the audience his experience with SOASTA and how it’s transformed their audience experience. With global web usage converting from desktop to a variety of screen sizes, most organizations have embraced responsive web design as a key part of their product strategy. As a result, stakeholders are making decisions to implement technical solutions across various platforms and form factors. There's a huge body of research demonstrating that page load time has a significant impact on business metrics ranging from conversions and revenue to user satisfaction and retention. Because of this, organizations are adopting a variety of solutions -- including single-page application (SPA) and Google Accelerated Mobile Pages (AMP) frameworks -- to deliver better, faster mobile experiences for their users. To effectively measure and correlate performance to business metrics, organizations are employing Real User Monitoring (RUM) solutions coupled with SPA and AMP support. This webinar will explore SPA and AMP frameworks in modern applications, and will show you best practices about how to monitor them in RUM, enabling you to understand and optimize performance across all form factors and to increase conversions and revenue. JMeter is popular with developers for creating tests that can be run easily during development. With the SOASTA CloudTest Spring release, it's easy to run JMeter tests in CloudTest from low-levels during development all the way to full scale load in production, with all of the great CloudTest features. Come learn how easy it is to shift-left and shift-right and make testing continuous.